I wrote about focusing on the book, not the costume for World Book Day here. But I don’t want to appear negative, for I adore World Book Day. It’s a day to celebrate writers, writing and favourite characters. The bus stop was quite a sight this morning with unicorns, Horrid Henrys, monkeys, including my own adorable Muggle Wump, some crocodiles, and I even spotted Where’s Wally. Kudos to me! Of course I didn’t take the bus this morning, I used my Harry Potter floo powder to get to the library. Other than dressing up, how can we celebrate books this World Book Day? There are lots of ideas on the WBD website, and hopefully many of us will visit our local independent bookshop to spend our £1 Book Day tokens. My son has a chart to fill in from school, in which he has to ask different members of society which is their favourite book and why. And he asked me. “One book” I shrieked. What torture! And then I realised which it was. This book is unique. I don’t think it can be pigeonholed as a children’s book, nor an adult book – although is often labelled as a classic. It’s historical, but not pegged as an historical novel. It’s semi-autobiographical (Louisa May Alcott didn’t correct readers writing her letters addressed to ‘Miss March’, but replied as if she were Jo.) It’s about feminism. It’s also a family saga, and a coming of age book. I suppose it was one of the first YA titles, although most children seem to read it as they reach the upper level of middle grade – about age 10-13yrs. Little Women tells the story of four sisters, Meg, Jo, Beth and Amy, during the American Civil War. Their father is absent, fighting in the war, and their mother is left to raise the girls alone. As they grow from children into adulthood, they face dramas of friendships, illness, arguments, breaking free from constraints of domesticity, and explore first love. The book highlights the wonder of storytelling, as well as espousing moral virtue over materialism, but the wonder of the book for many lies in the depth of characterisation of the four sisters. They are each so well-defined that, as with Pooh, Piglet and Eeyore, you can remember the character traits of Meg, Jo, Beth and Amy long into your own adulthood. Meg, the beautiful compliant daughter; Jo, the non-conformist hot-tempered tomboy; Beth, the shy, quiet creature, whose sacrificial death can be read as the death of the era of quiet domesticity; and finally Amy, the vain and self-centred baby of the family, who nevertheless excels at art and pursues her passion for it no matter the cost. It teaches such important lessons subtly – women’s access to education, overcoming shyness and having confidence, practising small kindnesses, charitable acts, and the importance of a sense of humour too. 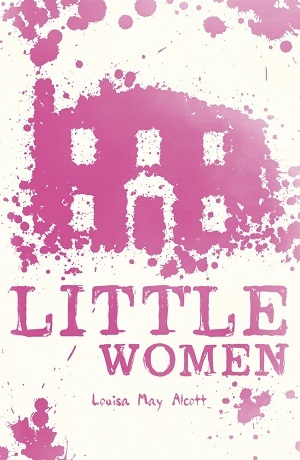 Little Women was even mentioned in that long-running television comedy Friends, when the girls ruined the story for Joey by telling him what happens to Beth in that devastatingly sad chapter, Dark Days. I don’t think there’s any other book from which I can remember the actual chapter titles. The description of Christmas with the Marches made me long for an American family Christmas just like theirs, and even made me consider calling my mother ‘Marmee’. It’s a beautiful re-read, and works wonderfully as a ‘read-aloud’ too. I implore you to revisit it – and then give it to your children. So I chose my one book. However, the fun of being a children’s book blogger and writer is that I don’t have to choose one book. I blog twice a week (sometimes more) about all the amazing books there are for children to read. And I have to read the books to enable me to blog. I interview the authors and tweet with other writers. It’s a privileged and rewarding task. Every day for me is World Book Day.